SACRAMENTO, Calif. (CN) – With a two-year stint at the top of the bench coming to an end, Sacramento Superior Court Presiding Judge Kevin Culhane is ready to hand over the reins and quietly blend back into the court’s daily operations. Perhaps he’ll make time to play the guitar in his band or fish for Mackinaw trout on Lake Tahoe, watch a little high school football. 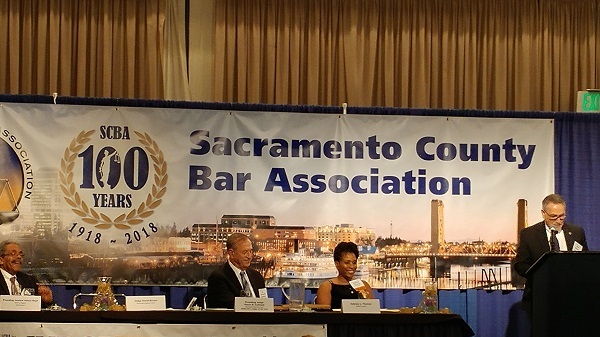 But not before taking home some hardware and praise from a host of esteemed jurists and politicians: Culhane, selected to lead the court in 2015, received the Sacramento County Bar Association’s Judge of the Year award Thursday night. In a reception dotted with dozens of state and federal judges, Culhane’s colleagues marveled at his successful run presiding over one of the state’s busiest courts. Speakers credited Culhane with bringing the court’s criminal calendar current, eliminating a judgment backlog and leading the push for a new courthouse in downtown Sacramento. “He must have a contacts list that rivals Bill Clinton’s,” Brown told the crowd. The comments were anything but conjecture. Brown solidified his remarks by reading from a powerful letter addressed to the presiding judge. Elected to the Sacramento Superior Court bench in 2008, Culhane has continued to teach law at nearby University of the Pacific McGeorge School of Law. Along with over 30 years of private practice experience, the Southern California native also served as vice president of the State Bar of California and has headed numerous Judicial Council committees. His winding legal career in Sacramento peaked after being selected presiding judge by his peers in 2015. Culhane inherited a court still recovering from budget cuts, telling Courthouse News in 2015 that on any given day several courtrooms stood dark due to a lack of staffing and resources. Budget shortfalls withstanding, the court has functioned efficiently under a series of changes implemented by Culhane. The court opened a new law-and-motion and civil settlement conference center in 2016, increased felony settlements by 25 percent in 2017, created a separate court for drunken-driving arraignments – all without continuing a single civil lawsuit under Culhane. Sacramento Superior Court continues to take on a heavy load of recusals and transfers from surrounding state courts. Culhane, who oversees 63 judges and estimated 665 employees, says he simply “figured out where his resources were and put them to work.” He also took advantage of experienced judges from surrounding courts in San Joaquin, Yolo and Placer counties, using them as a sounding board for his ideas. He reiterated to the attendees the importance of building solid relationships and networking. “Focus on the things that matter, ignore everything that just doesn’t. Serve the public, advance the law,” Culhane said succinctly. Along with Brown, other speakers included U.S. District Judge Morrison England of the Eastern District of California and Vance Raye, presiding justice of California’s Third Appellate District. Raye said Culhane’s judicial esteem is at a high point and called him a “capable and accomplished jurist.” California Gov. Jerry Brown also congratulated Culhane on the award in a letter. During his 30-minute acceptance speech, Culhane routinely acknowledged his family and colleagues for their support. Culhane thanked retired state judge and former Assemblyman Lloyd Connelly for agreeing to be the Sacramento Superior Court’s new executive officer. He acknowledged the only clerk he’s ever had, Sharon Powell, and found time to praise the accomplishments of his children and grandchildren. The presiding judge told his colleagues he hoped he was able to “move the needle” in a positive direction during his stint.